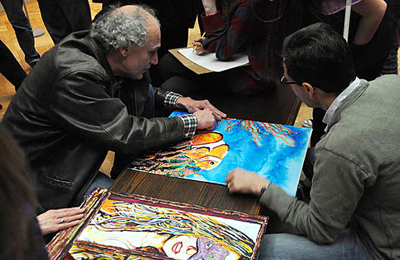 Siegfried Saerberg shows how the blind can experience a painting. Artist John Bramblitt leads a tour of the musuem. 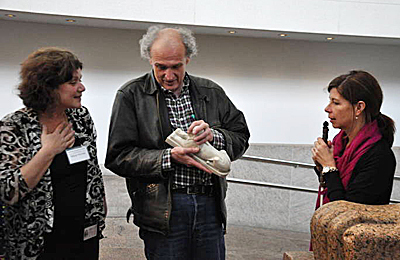 Siegfried Saerberg (center), a sociology and disability studies professor at the University of Dortmund, Germany, speaks with Met educators Nitza Horner (left) and Carolyn Halpin-Healy. Sellars was giving the keynote address at a conference sponsored by the organization Art Beyond Sight and the Metropolitan Museum of Art. I attended and found these few days transformative and wanted to share with the Juilliard community some of what happened since I am positive that you can apply much of what I learned to your own art making, be it in music, dance, or theater. In fact, I know that many of you already incorporate what are called multimodal approaches to learning in your work. The conference certainly opened my brain, eyes, ears, nose, fingers, and taste buds to new ways of looking at and immersing myself—and others—in the arts. The conference started inauspiciously for me when, after I registered, a man tapped me on the shoulder and asked whether we’d met before and what my name was. With a hint of impatience I pointed to my name clearly printed on my badge; but then, realizing with a start that he was blind, I stated my name clearly and said I was happy to meet him. My first revelation. It would take many pages to enlighten you as to what Sellars told us, but suffice it to say that this high priest of culture delivered an unforgettable sermon—one loaded with wisdom about art and its meanings and implications. He began by saying “The giant lie is normalcy,” and then burst out laughing. His joy was so infectious that before long, we were all laughing—artists, musicians, and art historians; blind and disabled people; and those who work with the disabled. The expressive sign-language interpreters enabled the deaf to join in. Like great dancers or actors, they gestured and emphasized Sellars’s words so that I, despite not understanding sign language, “read” their movements. Sellars told us that the “dis” in disability is not helpful; it’s just a different kind of ability. He said that wounds sensitize us to the world; they let in light, cutting into the armor we wear just to get through life. Art, like a wound, encourages us to express our differences. It is “the one place to affirm pain, loss, hope, to be lost,” he said. “We can never exhaust its depths. The original meaning of art is skill.” This skill empowers us to look deeply, listen hard, move expressively, taste with all our taste buds, and to use actively all of our senses. Art enables us to engage intensively. Among the speakers who followed Sellars was Rachel Herz, who specializes in the psychology of smell and teaches at Brown. “Our sense of smell is more directly connected to the brain than any other,” she said. Scent enables mothers to recognize their newborn babies within an hour of birth; it strongly affects human and sexual relations; it allows us to satisfy food cravings and identify spoiled foods; and it connects with memory and nostalgia. It’s also the only invisible sense and loss of it can lead to severe depression, Herz told us. I attended a few breakout groups in the afternoon, including one involving sound and digital art and another called the Art of Description that was led by Joshua Miele, a blind researcher who works on developing innovative approaches to information accessibility for the visually impaired. His panel was funny and informative. Participants’ specialties ranged from making digital media for better access for the blind, to simply touching works of art—enabling the blind to “see.” I learned that the blind touch differently than sighted people. Their fingers are extremely sensitized. If you’ve ever tried to read Braille, you’ll know what I mean. The second day of the conference introduced us to many more ideas, including the neurobiology of seeing, dyslexia, and methods of entering into an art work other than sight. Among them were poetic language, drawing, “becoming” the work, entering the space of a picture through one’s imagination (example: how do you feel inside the space of a deChirico? ), and hearing the sounds in the artwork. Since it is impossible in this small space to cover the many subjects addressed, I would like to conclude with a concrete example. 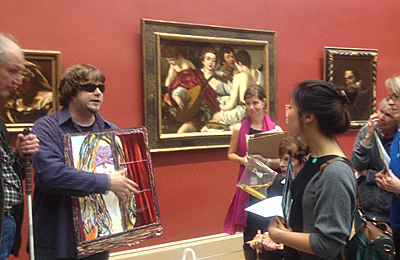 On the third day of the conference, John Bramblitt, an artist who lost his sight in 2001 due to complications from epilepsy, and Carolyn Halpin-Healy, a museum educator, gave a public tour of the museum, stopping for a long time at Caravaggio’s 1596 painting Musicians. Bramblitt began by describing the painting in which a young androgynous man plays a lute. He and Halpin-Healy then asked people on the tour to add details. The discussion went something like the following. Someone noticed points of arrows barely discernible behind the small figure on the left. Maybe the figure represents Cupid? Grapes are in his hand. The lute player and two other figures are absorbed in playing and singing though one of them looks out at us. The end of a horn is visible, as is a very small violin resting on music manuscript paper below them. The leaders asked what colors people saw—a brilliant reddish garment worn by the central figure, and pale European flesh color. How did the garments feel? What did they appear to be made of? They seem to be falling off the figures, revealing a lot of flesh. How does the music sound? And how do the grapes taste? Bramblitt played a tape of some period music for observers to hear. Participants were given sheets of paper to draw the contours of the figures and objects in the painting. Everyone, disabled or not, was fully engaged. Bramblitt also put some of his own paintings on a bench for blind and sighted people to see and touch. After the tour a friend asked me, “Does it make any difference whether people see exactly what the artist portrayed? They have their own picture, and have immersed themselves in the experience.” For me, this new way of thinking about painting was revelatory. In Bramblitt’s autobiography, Shouting in the Dark: My Journey Back to Light, he discusses the adage about the blind leading the blind—if a blind man leads a blind man, both will fall into a pit. But at the conference, it was the blind who helped me and others to achieve insight and avoid pitfalls. Art provides a mirror, Sellars said at the beginning of the conference. It reveals “secrets we all share; we need this mirror to reveal what we feel, what people conceal; it is a path through infinity.” It tells us, he added, “why we are here on earth.” This is the job of the artist: to make this mirror accessible to all.